Leading this year’s list among Philippine entries is diversified conglomerate SM Investments, which ranks 883rd overall. 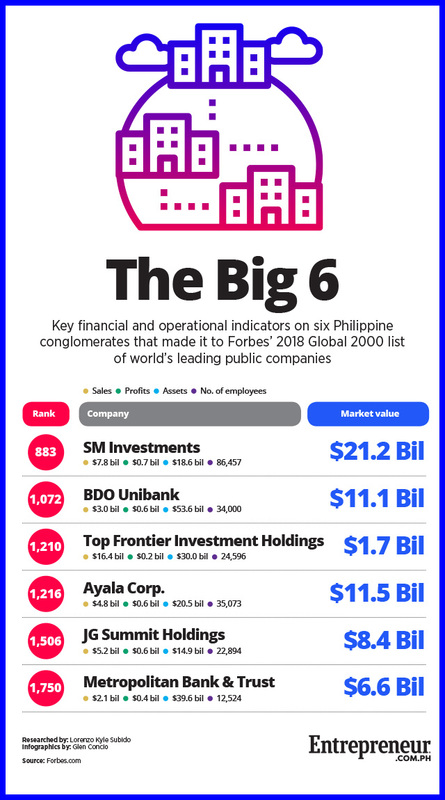 Helmed by Henry Sy, the country’s richest individual, SM’s major businesses include retail, real estate and financial services, with its banking unit BDO Unibank also making this year’s Global 2000 at No. 1,072. Collectively, these six companies are worth $60.5 billion (Php3.2 trillion), with total revenues amounting to $39.3 billion. According to Forbes, these six companies also employ over 215,000 people across their numerous business units. Forbes ranks companies in the Global 2000 based on four financial metrics: market value, sales, profits and assets. It has published the list annually since 2003. Forbes list Ayala Corporation BDO BDO Unibank entrepph Forbes Forbes Global 2000 JG Summit Holdings Inc. Metropolitan Bank and Trust SM Investments Corp. Top Frontier Investment Holdings, Inc.